1. Why did you choose Auburn, and select mechanical engineering as your major? I chose to attend Auburn University for the College of Engineering’s longstanding tradition of excellence and a family history of Auburn graduates. My grandfather would take me to Auburn games as a kid, and growing up around the environment gave me a slanted view when it came time to apply to schools. I also attended events such as E-day which further drew me in as a high school student who was excited about attending college. I chose mechanical engineering as my major because I was fascinated with the complexity of machines and structures, and I knew the major would expose me to a wide variety of areas and provide me with a broad skill set upon graduation. I also knew several mechanical engineers who graduated from Auburn, and conversations with them about their careers allowed me to gain a better understanding of what a mechanical engineering career would look like. 2. Since graduating, what have you done professionally and where do you work? Why did you select your current employer? After graduation I accepted a job with the U.S. Army Aviation & Missile Research Development & Engineering Center (AMRDEC). I work in the Aerospace Materials Function, Propulsion and Structures division, Weapons Development and Integration Directorate on Redstone Arsenal in Huntsville, Ala.. The Aerospace Materials Function primarily focuses on the research and development of composite materials for applications supporting the warfighter. My current involvement include design and structural analysis of missile and Unmanned Aerial Vehicle components, development of new processes for additive manufacturing and designing test hardware for in-house structural testing. I worked with AMRDEC as part of the Auburn co-op program, and my co-op experience was critical in obtaining a job with the Army. AMRDEC was able to evaluate me as a future employee, and I was able to give AMRDEC a trial run to see if it was something I wanted to do full time. 3. How did earning an Auburn Engineering degree prepare you for your job and future? My Auburn Engineering degree taught me the value of hard work. I left Auburn with a skill set that prepared me technically for my job, but realizing that nothing comes easily is a lesson that will stick with me throughout my career. 4. What advice would you offer mechanical engineering students? Find something that motivates you early in your undergrad career. Get involved with as many things as you can (research, car teams, student organizations), and figure out what you do and don’t like. Finding something that you are passionate about will make classwork more meaningful. It will make your interviews more persuasive when it comes time to convince someone they should hire you, and it will give you the confidence to reach out to that employer who isn’t recruiting from the Southeast. Similarly, if a student project you are interested in isn’t at Auburn, find a group of motivated students and make it happen. 5. 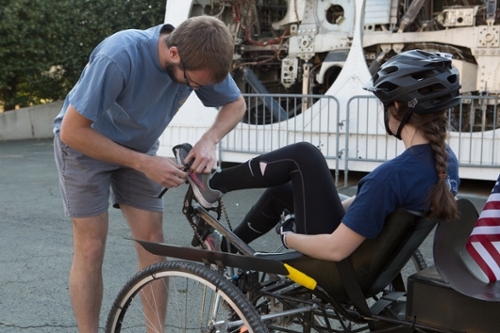 How do you give back to Auburn Engineering? And why is it important for young alumni to give back or engage with the college? I currently give back to Auburn Engineering through the 14 For 14 Campaign. The campaign is designed to engage young alumni and show them how their contribution can make a direct impact to Auburn Engineering. There are several projects in which the mechanical engineering department is trying to match financial support with already existing student generated projects, and knowing that I can support those students directly gives my donation even more meaning. 6. What is your favorite Auburn memory or War Eagle moment? The experience of storming the field after the 2013 Iron Bowl will forever be a hard memory to beat. Jumping the hedges with the student section was an Auburn experience unlike any other during my time there.